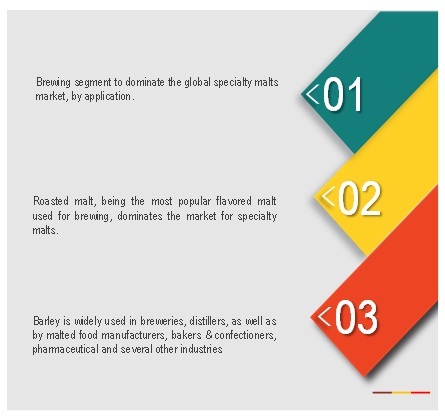 [133 Pages Report] The specialty malts market is estimated at USD 2.36 billion in 2017 and is projected to reach USD 3.01 billion by 2022, at a CAGR of 5.0% from 2017. Specialty malts can be defined as malts that consist of a larger percentage of lighter malts and a smaller percentage of flavored or colored malts. Specialty malts are uniquely steeped and kilned to achieve the desired sweetness, taste, color, and effect. Specialty malts can be classified into three main categories, namely, crystal or caramel malt, roasted malt, and dark malt. Roasted malts are usually kilned to a very high degree to achieve the desired result and are the most commonly used specialty malts in brewing. The base year considered for the study is 2016, and the forecast has been provided for the period between 2017 and 2022. Increase in demand for beer is encouraging the use of specialty malt in local breweries. The usage of specialty malt in the brewing industry is expected to boost the consumption of the craft beer, globally. The usage of specialty malt is expected to increase, owing to the increasing demand of flavored malt in brewing. The growing popularity of craft beer and domestic beer are likely to further raise the demand for specialty malt over the next few years. 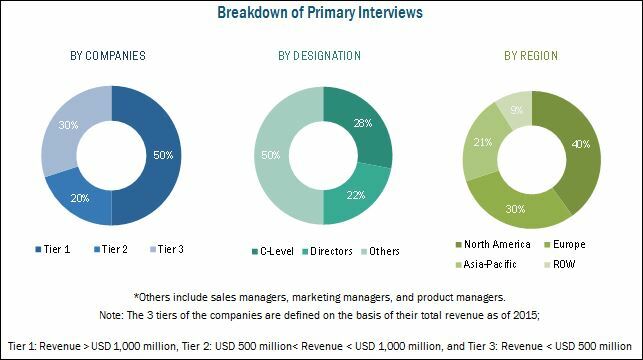 During this research study, major players operating in the specialty malt market in various regions have been identified, and their offerings, regional presence, and distribution channels have been analyzed through in-depth discussions. Top-down and bottom-up approaches have been used to determine the overall market size. Sizes of the other individual markets have been estimated using the percentage splits obtained through secondary sources such as Hoovers, Bloomberg BusinessWeek, and Factiva, along with primary respondents. The entire procedure includes the study of the annual and financial reports of the top market players and extensive interviews with industry experts such as CEOs, VPs, directors, and marketing executives for key insights (both qualitative and quantitative) pertaining to the market. The figure below shows the breakdown of the primaries on the basis of the company type, designation, and region considered during the research study. Key participants in the specialty malt market are the malt manufacturers, suppliers, and regulatory bodies. The key players that are profiled in the report include Cargill (U.S.), Malteurop Groupe (France), GrainCorp Ltd. (Australia), Soufflet Group (France), and Axereal Group (France). In May 2016, Viking Malt acquired Carlsberg’s subsidiary—Danish Malting Group A/S (DMG). DMG had three malting plants (one in Denmark and two in Poland) with a combined annual capacity of 220,000 tons. In May 2015, GrainCorp significantly expanded the malt production capacity at its Great Western Malting facility in Pocatello, Idaho, U.S. The project would increase the capacity at Pocatello by 120,000 tons, bringing the total annual malting capacity of the facility to 220,000 tons. In April 2015, Malteurop launched a new line of premium quality kiln-dried specialty malts. This extended Malteurop North America’s offering to satisfy the distinctive malt needs of craft brewers throughout the region. In November 2014, Axereal (France) and Tereos SA (France) France’s major sugar group, entered into long-term strategic partnership to develop an innovative range of solutions for their brewery and distillery customers. This partnership enabled Axereal to add value to the malting and glucose production activities. In October 2013, Cargill acquired Joe White Maltings (Australia) from Glencore International (Switzerland); this provided Cargill with a global footprint in all key global barley production areas, particularly in the Australian continent. What are new application areas which the specialty malt companies are exploring? The specialty malts market is estimated at USD 2.36 billion in 2017 and is projected to reach USD 3.01 billion by 2022, at a CAGR of 5.0% from 2017. The demand for specialty malts in various brewing applications and the growing usage of specialty malts in several food products have led to the growth of the specialty malts market. However, uncertain environmental conditions and seasonal variations of raw materials such as barley, wheat, and rye used to derive malt restrain the growth of this market. The brewing segment is estimated to account for the largest share in the specialty malt market. The major factor contributing to the growth of the brewing segment for specialty malts is the growing popularity and demand for craft beer across the globe. Roasted malt, being the most popular flavored malt used for brewing, dominates the market for specialty malts. The ease of availability of a variety of roasted malts such as Vienna malt, Munich malt, and Belgian malt for craft beers is another driving factor for the specialty malts market. Increasing consumption of alcoholic beverages resulted in an increase in demand from this industry for specialty malt. The beer industry is one of the major contributors, responsible for the increase in demand for specialty malts. Domestically brewed beer and popularity of craft beer are also fueling the market growth. Global players are investing substantially in technology and innovation for providing high-quality malt to the brewing, distilling, and food industries. Modern methods are used for stepping, germination, kilning, and deculming for getting better quality specialty malts. 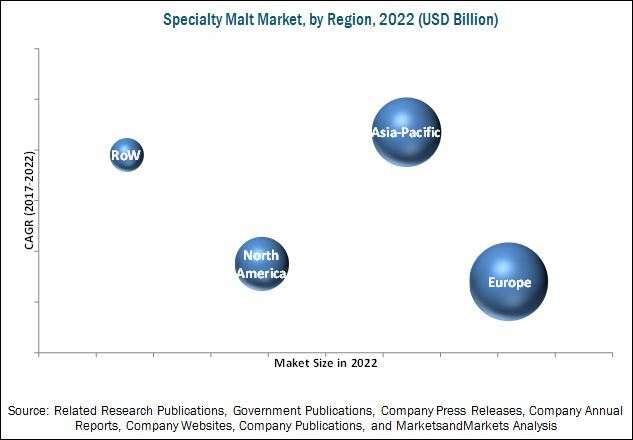 The global market for specialty malt ingredients is witnessing newer product innovations and various applications in different industries, signifying the progressive demand for specialty malts. The Asia Pacific region dominated the specialty malt market in 2015. The region has a large youth population with high disposable income, and has been witnessing rising demand for alcohol with the growing popularity of craft beers. The region also has large-scale production facilities and immense potential to fulfil market demand, and is therefore projected to witness a high growth rate during the forecast period. Malt is an essential component for making beer. The production of beer by steeping malt in hot water and fermenting the resulting mixture using yeast is called brewing. The process of brewing using specialty malt can take place in a commercial brewery, a home brewery, or by a variety of traditional methods used by industrial brewers. Beer is usually fermented with a brewer's yeast and flavored with malt. Malt sources that are not often used include sorghum, millet, and cassava. One of the major uses of malts is in distilleries whiskey, spirits, and other alcoholic preparations. The main reason behind the growth of the alcoholic beverages segment is the increasing use of malt in breweries and distilleries coupled with the rising demand for flavored whiskeys across the globe. Non-alcoholic malt beverages are generally ready-to-drink beverages with added natural or artificial flavors to achieve the desired taste. Barley is the most commonly used grain in malt beverages; however, some of these beverages may also be based from corn or wheat. The fermentation process involved for malt based soft drinks is similar to that used in beer production. Fermentation also helps to add flavor and texture to the final product. Malt-based drinks have developed a reputation over the centuries for their nutritional value leading to increased demand from developed regions. Specialty malts have been finding increasing applications in the baking industry being incorporated in several varieties of flavored bread, biscuits, cookies, and other preparations. The constantly changing tastes and preferences of customers for baked goods has forced manufacturers to experiment with different kinds of raw materials, including malt, in their preparations. Bread is a staple household food in most regions; several varieties of malt-infused breads are gaining popularity in developed regions. What are the upcoming industry applications for specialty malt? The specialty malt manufacturers faces challenges such as distribution network. The foremost challenge is pressure on the manufacturers’ profit margins as retail stores deliver products with lower profit margins even when they are not offering discounts. At the same time, retailers are putting higher demands on local manufacturers for more frequent deliveries in order to reduce their cost of warehousing. The specialty malt market is diversified and competitive with a large number of players. The key players in this market are Cargill (US), Malteurop Groupe (France), GrainCorp Ltd. (Australia), Soufflet Group (France), and Axereal Group (France). These companies use strategies such as mergers & acquisitions, expansions & investments, and new product launches to strengthen their position in the market. Several players adopted the expansion strategy to capture market share, globally, by investing in upgrading their production facilities, adding research laboratories and innovation centers in various regions. 14.11 Barmalt Malting India Pvt. Ltd.